I’ve been collecting vintage oddball guitars for most of my life. Perhaps the high prices of “non-oddball” guitars – 1958 Gibson Les Paul or a 1959 Fender Jazzmaster – kept me focused on the weird stuff, but after many years of buying/selling and restoring these babies, I decided to put together a webpage where people like me can gather to learn more about them. That is why www.myrareguitars.com is here. I’ve assembled hundreds of photographs under the Guitar Pics and Stories heading. Need to figure out what kind of guitar you have? Check out the pictures. 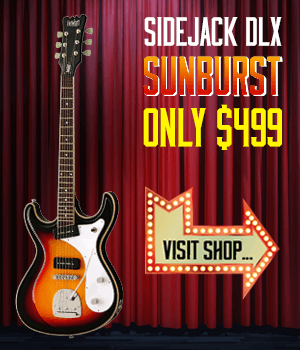 Need a walk down memory lane to see that first guitar you ever owned? Check out the pictures! Recently I’ve begun collecting NEW oddball stuff from outside USA. Why? 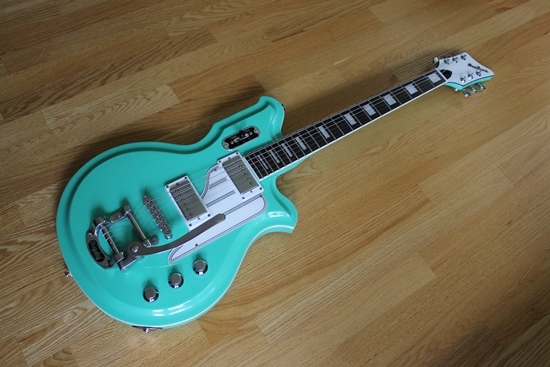 Many of my old favorites from the 1960’s have begun re-issuing their guitars. Four years I re-discovered EKO of Italy, 3 years ago Burns from London. Two years ago I discovered DiPinto Guitars>. Wow! Then the Italias came on line. I am constantly on the lookout for more guitars that fit into this vein. 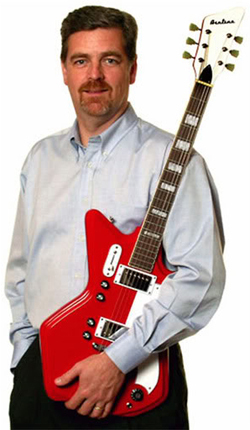 As I find them, I negotiate with the manufacturer to make these guitars available in the USA and Canada. I handle all the importing issues so you can buy them here at www.myrareguitars.com. A couple of years ago I decided it was time to start my own brand to re-create some of my favorites like Mosrite, VOX, Airline, UNIVOX Hi-Flyers, Coral Hornets, etc. That was the start of EASTWOOD Guitars. In our first year we sold over 500 guitars and built up a huge list of great reviews at Harmony Central . Thank you to all who contributed! Our goal is to develop 5-8 new models every year – in limited quanties – recreating many of the gone but not forgotten classics from the 60’s and 70’s. If you have any suggestions, let me know. Keep an eye on the “coming soon” page, where we post pictures of the upcoming prototypes. Many of my newer guitars are sold on EBAY simply because of the wide audience. If you want to see what other buyers have experienced in dealing with me, take a look at my eBay feedback . I always have a wide variety of guitars on sale there, but the cream of the vintage crop can be found here on the Affordable Vintage page. If you are looking for a deal, I have some guitars that are available in our demo section. These pages are updated weekly, so please drop by often. Please send your feedback and comments !!! This page is a work in progress. I want to find ways to make your experience a better one. Let me know what you need to see here and I will do my best to accommodate! P.S. SIX years ago I posted some info on EBAY about my quest for guitars that are “Even Better Than The Real Thing” to illustrate my passion for otherworldly guitars. I think this piece is still valid today, so I’ve included it here. Enjoy! My name is Ian Weintraub. My father, Bob Weintraub, was involved with Weiss Musical Instruments from it’s inception up until approx. 1976. He is in his late 80’s and has lots of great anecdotes and I’d love to put him in touch with someone who might be interested in his story before it’s lost for good. i found this article on Jack Westheimer at the Vintageguitar web site, which lead me to Michael Wright. and a quick google search of Michael’s name led me to this website. Can you forward my contact information on to Michael or anyone else you know who might be interested in hearing my dad’s story? It would be very much appreciated. Very excited to see this. My friend in Barrie Ontario is selling Burns as you probably know already, and I was smitten as a teen for oddball guitars- Eko 12 solid, Giannini 6 and 12 teardrop acoustic, and so on, but for all my life in guitars my absolute favorite was and is the Mosrite Ventures. Thanks for recreating such timeless pop art instruments. Long live The Ventures! I am tousik, I have a small guitar blog, I was researching today acoustic guitar and your website come up, I read this article URL and found it very interesting. I was wondering do you accept guest posts? I think I have a few interesting topics this your audience will love. If you want I can send you the list of topics.